Click on the Download free PDF button above. You will be asked to register and confirm your name and email address. Select which PDF(s) you would like to download. A link to download the PDF will then be sent to the email address. Please note it may be up to one hour before you receive the email. To be notified when future Free PDFs become available, be sure to sign up to the Floris Books mailing list in the subjects that interest you. 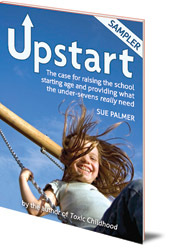 Chapter 1 of the book in which Sue Palmer puts forward a passionate case for Britain adopting a proper 'kindergarten' stage that recognises what under-sevens really need. Why does Britain and its former colonies send children to school as young as four and five, when in eighty-eight per cent of the world the starting age is six or seven? Sue Palmer, author of bestselling Toxic Childhood, uncovers the truth: it's not because of what's best for children, but historical accident and economics. This free sampler includes the first chapter from the book, which puts forward a passionate case for Britain adopting a proper 'kindergarten' stage that recognises what under-sevens really need. With clarity, ease and vigour, Palmer describes a different way of doing early years education that would have huge benefits both for individual children, and for our nation. Sue Palmer, a former headteacher in Scotland, has written more than 250 books, TV programmes and software on primary education and literacy. She has been an independent consultant to many organisations including the UK Department for Education and Skills, the National Literacy Trust and the BBC. She is the author of the bestselling and highly influential Toxic Childhood.